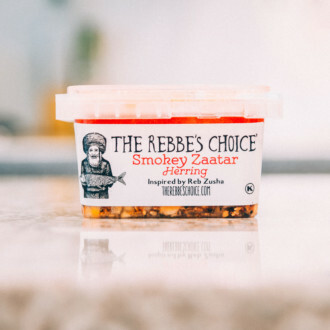 This sweet and savory herring was inspired by Rav Naftali Tzvi of Ropshitz (1790-1827). Born in the town Linsk (Lin-esk) Poland to a family of great lineage, Rav Naftali soon became a follower of the Hasidic movement as a student of the famed “Noam Elimelech” – Rav Elimelech of Lizhensk (La-zh-ensk). 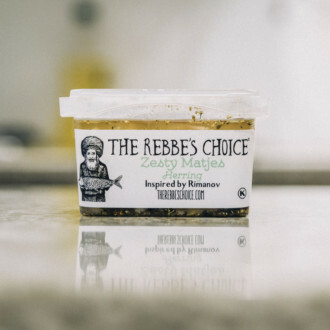 After soaking up the holy words of Rav Elimelech and other illustrious Hasidic masters he began to teach and attract thousands of students of his own, eventually settling in the small town of Ropshitz, Poland. Ropshitz quickly became famous as a source for beautiful, sweet, soul stirring melodies. Rav Naftali, a man with many layers of wisdom revealed his personality using his renowned sense of humor. Using his quick wit he concealed his most powerful lessons within jokes and anecdotes; famously saying “A prophet sees the future, and we see the present. Yet, sometimes it is more difficult to see the present than it is to see the future.” Rav Naftali’s amassment of Torah knowledge ranged from the definitive to the Kaballistic, his work “Zera Kodesh” is renowned for it’s deep insights and comments. 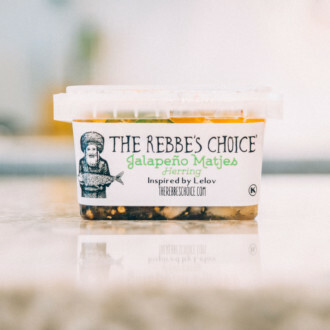 Rav Naftali’s sweet demeanor combined with his complex wit are the inspiration for the flavors of this delectable herring. Container Size: 12oz. 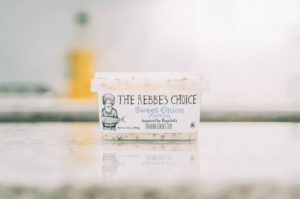 – about 20 – 25 pieces of herring per container.